There's a deal in place with Governor Cuomo to shield some teachers from Common Core junk science ratings. This is positive for those who are rated ineffective or developing due to Common Core junk science. Regrettably, those who are rated ineffective or developing due to non-Common Core junk science are out of luck. This is yet another band-aid. First, we temporarily shield the kids from CCSS high stakes. 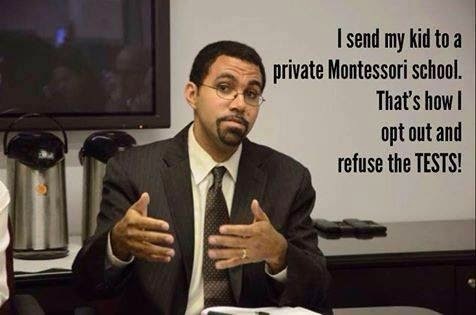 Then, we temporarily shield the teachers from CCSS high stakes. With the incredible statewide anger we saw the King face last year, someone had to do something. The problem is, there's this underlying assumption that the problem is in the rollout. It's the execution, not the program itself. What is this based on? There's never been any proof that Common Core has any validity whatsoever. It's never been field tested. Perhaps the most extensive field test to date has been the NY State rollout, and that's been an abject failure. What do we learn from this? That we should fail more slowly? We know what works for our kids. Our kids need good teachers, and we don't measure good teachers by Common Core junk science, by non-Common Core junk science, or by any variety whatsoever of junk science. Despite the druthers of self-appointed education experts like Bill Gates, there are some things you just can't quantify with mathematical formulas. Were that possible, teenagers everywhere would be clamoring for Windows phones. I don't really mind the band-aid if it will help even one teacher in the state. But a much better program would be to get rid of junk science altogether. To do that, we will have to get rid of the politicians who are in the deep pockets of Gates, Broad, Walmart, et al. Let's see whether UFT or NYSUT takes an active stand against Quid Pro Cuomo. Bear in mind that doing so does not entail merely sitting out the AFL-CIO nomination, but rather opposing and therefore precluding it. Anything short of that is enabling our "seat at the table." We need that seat as much as we need junk science, just as much as unions need Andrew Cuomo. So wait and see. But in fairness, I must advise you to sit while you wait.